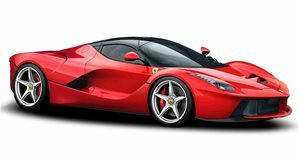 Would you be able to sleep with a $2 million LaFerrari Aperta sitting unloved in your garage? If you’re reading this while in the office bathroom killing time before working on that spreadsheet due at 3, chances are you had to wake up at the same time as the birds. A minute earlier or a single milligram of caffeine less and you’d lose it, especially if the former of those conditions happens because of a noisy moving van passing down the street. This time, however, is one of those rare instances you’d wish this set of wheels passed by your apartment for the wakeup call. That’s because this alarm clock is one of the most rare on Earth. Only 209 will ever be built and each of them cost its chosen owner $2 million (or $7.3 if it was snagged at a dealership in Dubai). And though it’s a hybrid, it also carries a raucous 6.3-liter V12 engine that's ready to stir up trouble. This LaFerrari Aperta decides to do just that one early London morning. Money never sleeps, and this Aperta proves it by coaxing a lucky driver out of bed before the sun is up and the commuters clog every available lane, just for a loud wild ride around town. If only one of these would swing by the house every morning, life would be much more interesting and filled with motivation.